Walk a few steps past the pool and you're on the beach. Pull up a lounge chair on the seaside lawn. 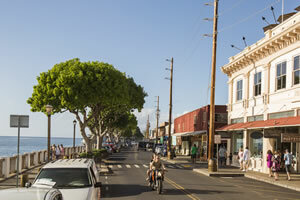 The art galleries, restaurants, and shops of Lahaina are a few blocks away. Cool off with a dip in the pool that looks out to the sea. Unwind in your condo after a day of fun. Many kitchens feature elegant granite countertops and stainless steel appliances. You're just steps away from the shore. Relax side by side with an ocean breeze and walk into town for romantic evenings. This smaller resort is quiet, but close to the action. Stroll to dining and evening entertainment in downtown Lahaina. This beach resort is located at the north end of historic Lahaina, a former whaling port turned cultural and artistic capital. Lahaina Shores Beach Resort features an oceanfront pool and whirlpool spa, just a few steps from the beach. Though the shoreline is narrow, it gives you prime access to snorkeling, swimming, and makes for a nice walk. It’s a quieter resort with 199 individually owned condos. All suites come with fully-stocked kitchens, spacious living rooms, and private lanais. You can opt for views of the breathtaking West Maui mountains or the ocean. You can hear the waves lapping against the shore from the restaurants and art galleries of Front Street. Maui's historic town has great shopping, gourmet dining, and is the launch point for whale watching and other family expeditions.